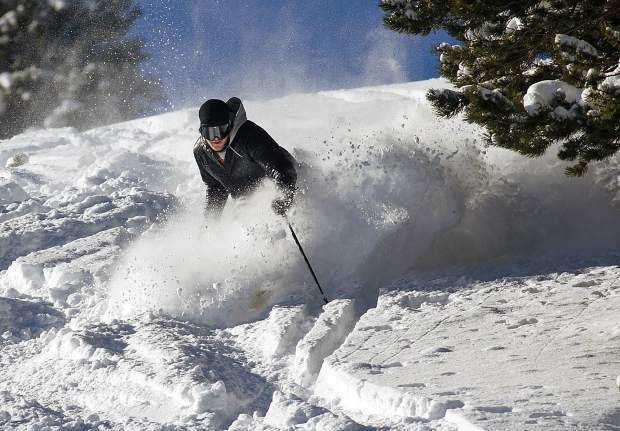 A skier makes a turn in fresh snow on Breckenridge Ski Resort's opening day Nov. 7 in Breckenridge. The early season snowfall is being credited for boosting the town's November sales tax receipts. November was business as usual across much of Summit County with Breckenridge, the town owning the largest tax base, finishing the month up 13.9 percent over November 2017. With November being the latest month in the books, Breckenridge marked its sixth straight month of estimated taxable sales growth and remains 8.92 percent ahead in a year-to-date comparison. Breckenridge businesses have now recorded over $524 million in total taxable sales throughout 2018 with December still to go. Breckenridge’s rocket-ship growth is being largely fueled by three sectors — general retail, restaurants and bars, and lodging — which have each accounted for more than $120 million in sales from January to November. And November was another good month for all three of them. During it, the general retail category was up 19 percent, its fourth straight month of double-digit month-over-month growth. At the same time, sales in the town’s two other biggest categories — restaurants and bars and lodging — were both more than 20 percent ahead of November 2017. Meanwhile, grocery and liquor sales were up a more modest 4.71 percent for Breckenridge. Of the town’s eight measured categories, only construction and utility are behind year to date. November was “quite remarkable” for Frisco as well, noted Frisco revenue specialist Chad Most, who saw the town’s sales tax receipts climb 14.64 percent over where they were in November 2017. In fact, 10 of the town’s 17 taxable categories experienced growth in November and 13 were up year to date, leaving Frisco’s overall sales tax receipts up 6.39 percent through November year to date. In terms of actual dollars, Frisco’s grocery, general retail and restaurant categories saw the most significant growth. Most attributed the “tremendous” growth rate in grocery sales partly to a lower total in November 2017 due to an outstanding collection for that period. “However, the early season snowfall (this year) and Frisco’s growing reputation as the most convenient location for centralized grocery shopping options along the (Interstate 70) mountain corridor each had greater impacts,” he said. In Dillon, November’s sales taxes came in 5.04 percent higher than they were in November 2017, which put the town 9.2 percent ahead year to date. Dillon finance director Carri McDonnell noted that the town’s hotels, lodging and retail were all up compared to November 2017, and, like Most, she said early snow has likely played a role in the figures. November’s sales tax receipts slipped 3.05 percent in Silverthorne. It was only the second time the town has seen a month-over-month decline this year, but Silverthorne’s sales taxes still remain up 4.46 percent year to date. Expanding sales in the building retail, service and food and liquor categories have driven that growth for Silverthorne. The town continued to see expanding food and liquor sales in November with the month’s receipts up a healthy 22.34 percent over November 2017. “This was due to new restaurants opening in 2018 and strong sales from existing restaurants,” Silverthorne revenue administrator Kathy Marshall said via email. More jaw-dropping, November lodging in Silverthorne was up 71.72 percent over the same month in 2017. While the hotels and motels subcategory experienced a roughly 15 percent spike, Marshall said, short-term rentals did the heavy lifting by shooting up 190 percent, due in part to more of them coming into better compliance with town rules. The most noteworthy decrease in Silverthorne’s November sales tax revenue surfaced with The Outlets at Silverthorne, which were down 18.71 percent compared to November 2017. Some of the biggest stores saw sales declines anywhere from 20-40 percent, according to Marshall, even as the Outlets are down a less dramatic 1.2 percent year to date. On the bright side, sports equipment rentals in Silverthorne were up almost 20 percent for the month. While most in-town retail stores showed increased November sales, Marshall said that declining online sales tax remittances mostly wiped out those gains for the category, which posted an 8.49 percent decline.